While I had initially planned on using the Yeti Snowshoe Race as my 5k for the Kyle's Krusade Virtual Race (to Lisa of RunWiki.org's great excitement), its cancellation left me looking for another 5k I could use. The Training Plan said that Monday was to be a 5.6km run, so that would have to do. The days had been cold of late, but my 16km run on Sunday had gone well so I decided to Race with a Capital 'R'... even though there was no-one else there. If young Kyle had to fight cancer, could I offer any less than an all-out effort? I hoped for a sub 25 minute finish, but I had a few factors against me: I had left both my Garmin and my water bottle belt at home. I'd be relying on my Endomondo app to track my pace and distance. Figuring that I'd be working hard, I skipped a thermal layer, and didn't bother with face protection. I can't say that it was a mistake overall, but it did make the start a little uncomfortable. As I ticked off the kilometres, I stayed under 5 minutes per kilometre, which was what I needed to stay under 25 minutes overall. My lungs were burning a little, and some of the sharp turns were not ideal for 'racing'. You can see the fatigue (and incline) kick in on the 4th kilometre, and for a few minutes I thought I'd have to overshoot my starting point due to some kind of miscalculation, but I heard the 5 km indicator right as I got to the intersection. 24:39, a personal best. I want to thank Lisa for devoting her time and effort to such a worthy cause. Not everyone wants to do this kind of organization and logistics for the enjoyment of others. 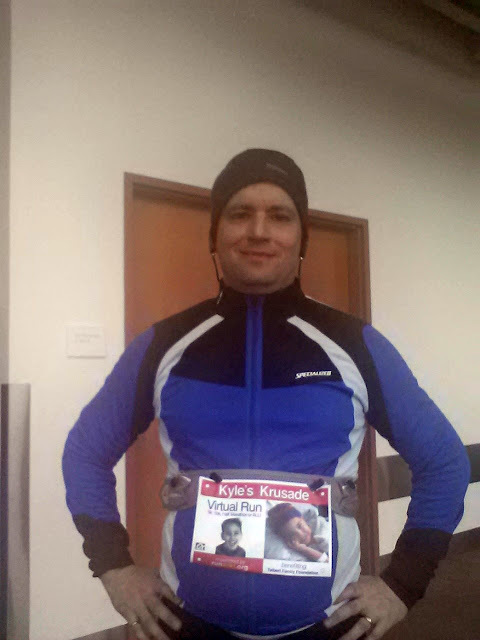 Kyle's Krusade Virtual Races can be done all through February and you can do 5k, 10k or even a half-marathon. Or you call simply donate... just follow the links!